Clear and meaningful reporting is essential to holding organisations to account for their performance. 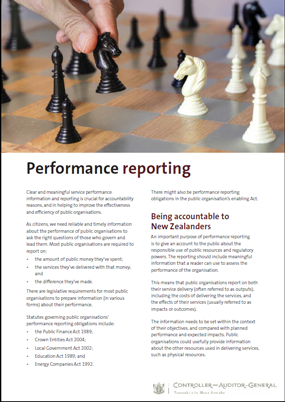 An important purpose of performance reporting is to give an account to the public about the responsible use of public resources and regulatory powers. The reporting should include meaningful information that a reader can use to assess the performance of the organisation. This means that public organisations report on both their service delivery (often referred to as outputs), including the costs of delivering the services, and the effects of their services (usually referred to as impacts or outcomes). The information needs to be set within the context of their objectives, and compared with planned performance and expected impacts. Public organisations could usefully provide information about the other resources used in delivering services, such as physical resources.